The history of ancient Lebanon traces the course of events in what is now known as Lebanon from the beginning of history to the beginning of Arab rule. 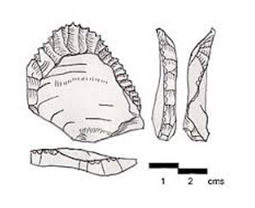 The evidence of tools found in caves along the coast of Lebanon shows that it was inhabited all through the classic stages of human development: Paleolithic, Neolithic, the bronze, and the iron working periods. Neanderthal and Cro-Magnon people were making flint tools in this region around 50,000 years ago. Village life followed the domestication of plants and animals with the Neolithic Revolution starting around 10,000 BC. The traces of the coastal settlements in Lebanon date back to around 9000 BC in Byblos, favoring its founding among the earliest ‘communities' during this period. The recorded history shows a group of coastal cities and heavily forested mountains inhabited by the Canaanites around 4000 BC. These early inhabitants referred to themselves according to their city of origin, and called their nation Canaan. They lived in the narrow East-Mediterranean coast and the parallel strip mountains of Lebanon. Around 2800 BC Canaanites traded cedar timber, olive oil and wine from Byblos for metals and ivory from Egypt. The Coastal cities fell to Amorites around 2000 BC, and to Egyptians from round 1800 until 1200 BC when they recovered independence. 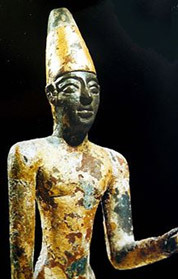 The Canaanites who inhabited that area were called Phoenicians by the Greeks (from the Greek word phoinos, meaning ‘red') in a reference to the unique purple dye the Phoenicians produced from murex seashells. The Phoenicians mastered the art of navigation and dominated the Mediterranean Sea trade for over 500 years. They excelled in producing textiles, carving ivory and working with metal and glass. The Phoenicians built several local cities East of the Mediterranean among which are: Byblos, Tyre, Sidon, Berytus (Beirut), Tripoli, Arvad Island-City, Baalbek and Caesarea. The Phoenician king Hiram of Tyre (989-936 BC) built a palace for David and two palaces and a temple for Solomon. The Bible provides a vast amount of information about them. The Phoenicians built David's Palace and Solomon's Temple. 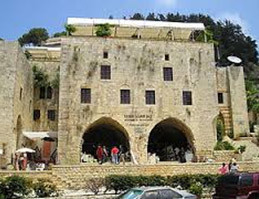 They also built King Solomon two palaces, of which one was called 'Forest of Lebanon'. Craftsmen of Phoenicia used Lebanon's cedar and metal to accomplish the work around the mid of the tenth century BC. 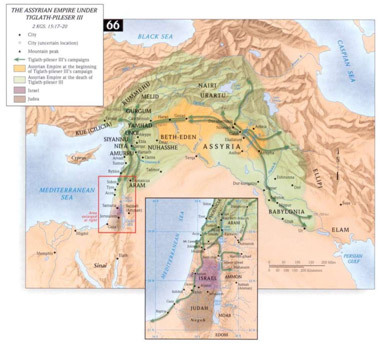 The power-raising Assyrians invaded Phoenicia in 875 BC and deprived the Phoenicians of their independenceand prosperity and brought repeated, unsuccessful rebellions. In the middle of the 8th century BC, Tyre and Byblos rebelled, but the Assyrian ruler, Tiglath-Pileser III, subdued the rebels and imposed heavy tributes. Oppression continued unabated, and Tyre rebelled again, this time against Sargon II (722-705 BC), who successfully besieged the city in 721 BC and punished its population. During the 7th century BC, Sidon rebelled and was completely destroyed by Esarhaddon (681-668 BC); its inhabitants were enslaved. Esarhaddon built a new city on Sidon's ruins. By the end of the 7th century BC, the Assyrian Empire, weakened by the successive revolts, had been destroyed by the Median Empire. The Babylonians became the new power and occupied Phoenicia. Phoenician cities rebelled and Tyre was destroyed, again. The Achaemenids ended Babylonian rule in Lebanon, when Cyrus, founder of the Persian Empire, captured Babylon in 539-38 BC and Babylonian province of Phoenicia and its neighbors passed into Persian hands. Cambyses (529-22 BC), Cyrus's son and successor, continued his father's policy of conquest and in 529 BC became suzerain of Syria, Lebanon, and Egypt. The Phoenician navy supported Persia during the Greco-Persian War (490-49 BC). But when the Phoenicians were overburdened with heavy tributes imposed by the successors of Darius I (521-485 BC), revolts and rebellions resumed in the Lebanese coastal cities. The Greeks defeated the Persian troops when Alexander the Great attacked Asia Minor in 333 BC. The Phoenician cities made no attempt to resist and acknowledged Alexander's suzerainty. However, when he tried to offer a sacrifice to Melkurt, Tyre's god, the city resisted and he besieged it. The city fell after 6 months of resistance. Alexander's conquest left a Greek imprint on the area. The Phoenicians, being a cosmopolitan civilization amenable to outside influences, adopted aspects of Greek civilization and continued with their trade business. The Romans added Lebanon to its Empire. 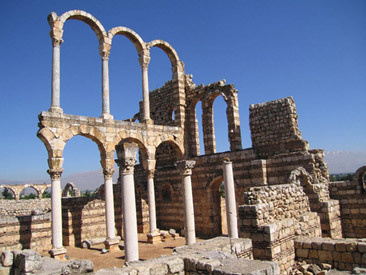 Economic and intellectual activities flourished in Lebanon during the Pax Roman. 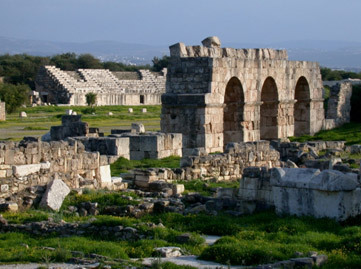 The inhabitants of the principal Phoenician cities of Byblos, Sidon and Tyre were granted Roman citizenship. These cities were centers of the pottery, glass and purple dye industries; their harbors also served as warehouses for products imported from Syria, Persia and India. They exported cedar, perfume, jewelry, wine and fruit to Rome. Economic prosperity led to a revival in construction and urban development; temples, palaces and the first School of Law in history were built throughout the country, as well as paved roads that linked the cities. Ruins of Roman temples and monuments are found all around Lebanon with the largest in Baalbek. The Bible states that the first woman who believed in Christianity, became the first convert outside the Jews was a Phoenician woman. From the Northern Phoenician ports Saint Peter left to Rome and built the first church. After the Roman Empire divided, the economic and intellectual activities continued to flourish in Beirut, Tyre and Sidon for more than a century. The fifth century witnessed the birth of Maronite Christianity. 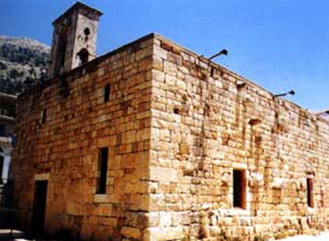 Saint Maroun (also Maron) found a refuge in the northern mountains of Lebanon. A great portion of the Phoenicians became Christians, and their faith was named for him. Maronite Catholics later made great contributions to the Lebanese history, independence and culture. The sixth century witnessed an increased feeling of nationalism in Mount Lebanon and the Phoenician coast that gradually gave way to the name of Lebanon for the entire territory. The seventh century started the shaping of the multi-cultural Lebanon we know. The mountains became more populated especially by the Maronites and Marada. Later, the Aramaic/ Assyrians and Cheldanites joined them, escaping persecution. The followers of the new religion of Islam fit coherently in the community since most of them were not migrants from Arabian Peninsula, but locals who converted to Islam. After Arab Muawya was appointed as governor of Syria, he garrisoned troops to the Lebanese coast. Historians mention that the Arab-Muslims neither could, nor were willing to, fight in the mountains of Lebanon. Hence, they captured only coastal lands. Lebanon maintained a special situation with special autonomy. Some Arab historians wrote that Lebanon sometimes was not even treated as a part of the Islamic Empire. It was the only region were most of the population did not enter into the new religion of Islam. While the Roman Empire army fell facing the Muslim troops, the Mountains of Lebanon stood still. Mauwyah had to pay financial tribute to the Lebanese- Maronites and Marada in order to stop their raids on Arab troops in 670 AD. Muawyah also seeked the Lebanese ship builders help to construct a navy. The Lebanese took care of the navigation while the Arabs led the troops in a successful battle against Cyprus 649 AD. The Lebanese adopted many aspects from the Arabic culture, and excelled in science and Arabic literature. It was the people who lived in the mountains of Lebanon, especially the Maronites and the Aramaic who translated the Greek books into Arabic and later on built with the Arabs the advanced Arabic science based on these books. Later, under Umayyads Islamic rule, Mount Lebanon kept its characteristics; the Umayyads were not concerned much about converting people to Islam, especially those with farmlands, and are well fortified in the mountains. The Abbasids replaced the Umayyads ruling the Islamic Empire in early 750. They treated Lebanon as a conquered country. Their harshness led to several revolts, with the most famous being the rebellion of the Lebanese mountaineers in 759 AD. By the end of the tenth century the prince of Tyre proclaimed independence from the Abbasids and coined money with his own name. However, his rule was later terminated by the Fatimids. One of the groups that came to seek refuge in Lebanon was a small Christian sect called Melchites, they became known as Greek Catholics. Also, the Druze who was persecuted as hypocritical Islamic-Shia group found a refuge in Mount Lebanon around 1020. Under Abbasids philosophy, literature and science received great attention. Lebanon made a notable contribution to this intellectual renaissance. Lebanese physician Rashid AdDine, jurist Al Awzai and philosopher Qusta ibn Luqa were leaders in their fields. After capturing Jerusalem, the Crusaders turned to the Lebanese coast. Tripoli surrendered in 1109 while Beirut and Sidon in 1110. Tyre stubbornly resisted but finally fell in 1124 after a long siege. 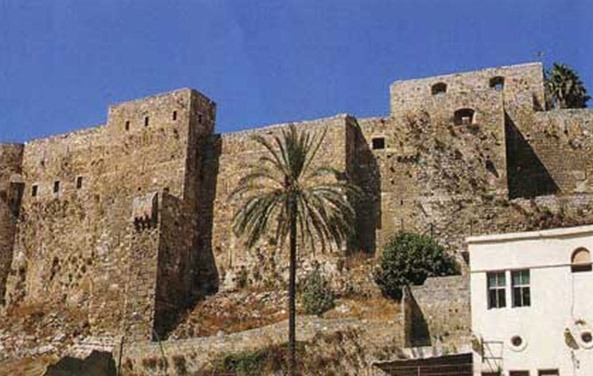 Although they failed to establish a permanent presence, the Crusaders left their imprint on Lebanon as clear in the remains of many towers, castles and churches along the coast and in the mountains. The Crusaders, the Mamluks and Mongols armies sought to master the region during the thirteenth century; however the victory came to the Mamluks. Mamluk Islamic dynasty ruled Egypt for more than two centuries. They ruled Syria and parts of Lebanon in the late thirteenth century. Meanwhile, from the 11th to the 13th century, the Shia Muslims migrated from Syria, Iraq and Arabian Peninsula to Lebanon seeking refuge. The Shais and Druze rebelled in 1921 while the Mamluks were busy fighting the Crusaders and Mangols. They turned later and crushed the rebellion in 1309. Beirut became a center of intense trading activities between the Middle East and Europe. Intellectual life in Lebanon flourished, and economic prosperity continued till the end of Mamluk rule. The Ottoman Empire who occupied the Middle East and Eastern Europe in the sixteenth century, ruled Lebanon through local leaders. Lebanon managed to get conditioned or total independence several times under Ottoman rule. The Ma‘ans came to power in the early 16th century, and both Fakhr al-Din I and Fakhr al-Din II greatly expanded the territory of the original Imarat al-Shuf while acting as the principal local tax farmer (multazim) for the Ottoman state. In general, the tax-farming system meant that the multazims always served at the sultan's pleasure, and given this degree of insecurity they would try to collect as much tax as they could, within the limits of the taxpayers' physical ability to pay. Prince Fakhr EdDine II was a druze Lebanese who built a modern Lebanese community. In an effort to attain complete independence for Lebanon, he concluded a secret agreement with Ferdinand I, duke of Tuscany in Italy against the Ottomans. The Ottomans found out about that and sent him to exile in Tuscany in 1613. Fakhr EdDine returned to Lebanon in 1618 and built a regular army that reached 100,000 soldiers formed from the different religious sects of Lebanon. The Lebanese Army defeated the army of Mustafa Pasha, Ottoman-appointed governor of Damascus, in a historical battle at Anjar in 1623. The Lebanese prince initiated several measures to modernize the country forming close ties with the dukes of Tuscany and of Florence. He brought architects, irrigation engineers and agricultural experts from Italy. He strengthened Lebanon's strategic position by expanding its territory. The Lebanese prince ruled a land that extended; North to Kelikia (Turky); South to Arish (Egypt); and East to Damascus (Syria) with Beirut being the Capital. That area was more than three times larger than Lebanon today. In order to stop Lebanon's progress toward complete independence, the Ottomans ordered the Governor of Damascus to attack the Lebanese ruler. 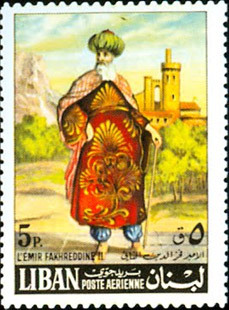 Fakhr EdDine was defeated, and was executed in Constantinople in 1635. When the last male descendant in the Maan family line died in 1697, his vassals chose Haydar al-Shihab as emir. The Shihab (or Chehab) family was somewhat unusual in a region politically dominated by Druze dynasties, as they were nominally' practitioners of Sunni Islam. 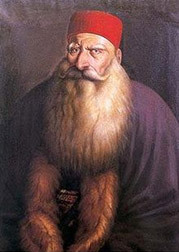 The Shihabs, starting in 1711, introduced a unique system of fiscal cantons in the Shuf mountains and Kisrawan, and later in the northern Lebanon, giving their regime a special character within the Ottoman system. The Shihab emirs were appointed as multazims of their territories on an annual basis, and their position in this respect was always precarious, yet they remained at the top of the feudal hierarchy. The Ottomans divided Lebanon into districts, segregating or adding regions as deemed convenient for them to weaken the country; they annexed part of it to Syrian districts in attempts to erase the Lebanese identity. Furthermore, they attributed sectarian divisions and appointed rulers accordingly, to create religious conflicts. In 1860 feudal sectarian conflict raised between Druze and Christians led to thousands of victims. European forces landed in Lebanon to quell the fighting. To solve the problem, the six powerful countries then forced the Ottomans to award Lebanon regional independence with Lebanese administration and armed forces. 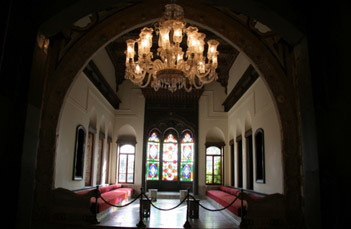 Lebanon became an intellectual and commercial center in the second half of the 19th century. Foreign missionaries established schools throughout the country. The American University of Beirut was founded in 1866, followed by the French St. Joseph's University in 1875. The Arabic literature had renaissance era marked by numerous publications where Lebanese authors outshined. It was the Lebanese first prolific press in the East that managed to preserve the Arabic literature from distinction under Ottoman oppression. 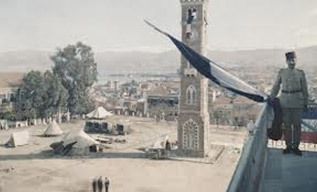 After the outbreak of World War I in August 1914, the Turkish (Ottoman) forces in Syria occupied Lebanon and appointed a Turk ruler over the country. The Lebanese refused the occupation. The Turks responded by commandeering Lebanon's food supplies causing famine and plagues. Lebanon lost more than one third of its population then. The Turks cut down Lebanon's trees to fuel their trains and military consuming more than half of Lebanon's forests. In 1916 the Turkish authorities executed Lebanese leaders in Beirut for alleged anti-Turkish activities. That date of May 6th is commemorated annually in Lebanon as Martyrs' Day. Lebanon was relieved in September 1918 when the British general Edmund Allenby and Faysal I, son of Sharif Husain of Mecca reached the region. In 1920, the League of Nations gave France a mandate over Lebanon. On September 1st, 1920, France proclaimed the establishment of Greater Lebanon with its present borders. In 1926, the Lebanese constitution was modeled after that of the French. The constitution provided a parliament, a president and a cabinet. The president is elected by the parliament, which is popularly elected. After the allies won World War II, Lebanese national leaders asked France to end the mandate. 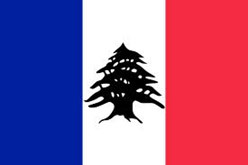 France proclaimed the independence of Lebanon in 1941 but continued to exercise authority. In 1943, Lebanon formed its first democratic government of independence and amended the constitution ending the mandate. The French authorities responded by arresting and imprisoning the Lebanese president, prime minister and others. Lebanese Christian and Muslim leaders united their forces, advantaging from the international and regional influence, to pressure the French government that yielded by releasing the prisoners on November 22, 1943 and recognizing Lebanon's complete independence. The French helped rebuilding the Lebanese infrastructure, economy and social systems. They developed a network of roads linking major cities and enlarged the harbor of Beirut. The governmental and judicial systems were fundamentally developed while the educational, agricultural and public-health systems improved.